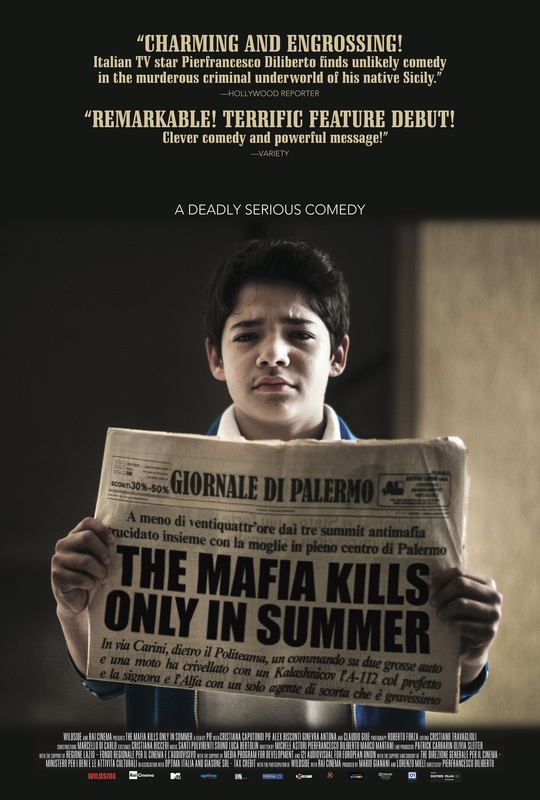 The film centres around a young Sicilian boy, Arturo, who ever since birth has found himself inadvertently linked to the mafia. The film chronicles his life in two stages: first in childhood and then again after he has matured in to an adult. His schoolboy love interest (and eventual wife), the sole source of narrative continuity that connects what feels like two distinct halves of the movie. Arturo’s experiences are peppered with the appearances of and interactions with key cultural icons, which weave together the tales of both mafioso and victim alike. The film is a directorial debut for Italian writer/actor, Pierfrancesco ‘Pif’ Diliberto who’s background in broadcast journalism, satire and documentary film-making lends great context to the themes explored in this movie. The stand out part for me was the opening scene in which you are introduced to the protagonist and his connection with the mafia. The narration had a nicely phrased (bordering on ironic) tone, which was reminiscent of the wry comedic wit of Wes Anderson’s Grand Budapest Hotel, with an edgy tone of something much more sinister. The almost noir-esque scenes of the mafia underbelly directly juxtaposed against the animation of Arturo’s eventual conception, were a great start to the movie and gave me much promise for the rest of the film. Diliberto continues for the next few scenes artfully weaving a compelling picture of what life was like for the resident of Palermo, Sicily. The quick leaps between Arturo’s impressionable experiences, vignettes of everyday mundane life, seem to accurately portray the Mafia’s pervasive hold over the city and its residents. However, while I found myself entertained by the first half of the movie, the second half left much to be desired. Don’t get me wrong, there are moments of great comedy evident here – the scene in which the Father finds himself grasping at the bars on the school gate like a prisoner in a cell, is refreshingly self-aware but hints at a foreshadowing that fails to eventuate. There are also moments of true heart-aching sadness – for the residents of Palermo who mourned so deeply for their lost leaders, and more intrinsically at the realisation of their own oppression under the insidious control of the Cosa Nostra. There are some glimpses of great portraits in some of the Mafia’s unfortunate victims, albeit brief and lacking in any truly substantive character. I felt at arms length with the characters for most of the movie, never quite slipping deep enough to feel any true sense of connection to their plight. However, it’s evident that Diliberto holds these characters in high esteem; which is reinforced in the latter half of the film as an adult Arturo (played by Diliberto himself) revisits each of the spots in which those men lost their lives, hoping one would imagine to impart some sense of wisdom to his son. While Diliberto is well known for his expeditions in satire, I found this film slightly too subtle in its criticisms. Granted the villains were conveyed as generally bad and unsavoury characters, and their victims were shown to be genteel and honourable in manner; but could have so easily been extended farcically further. In fact, I found the only character who actually appeared to be made a caricature of was Arturo himself. Energetic and cartoonish-ly dweeby as a love sick child to the self-conscious, misplaced awkwardness of the adult he becomes; those qualities found to be endearing in boyhood. quite removed in maturity. This film felt ambitious in its undertaking but in my opinion really failed to deliver. The characters, while highly revered and showed glimmers of true insight were ultimately superficial, the sentiments naive and almost dispassionate. The almost formulaic approach to the plight, pointed at an activist not quite connected to the cause. For me, the opening scene set the bar high and while it didn’t completely fail to impress, the sly truely satirical wit earnestly promised appeared to fall away. Replaced instead with a unsure tone, awkward and unfocused, with the plot sometimes reaching moments of complete confusion. While my criticism may be harsh, this is not by any means a bad movie. My knowledge of the political climate in Sicily is strengthened and I did feel true compassion for the people of Palermo and an affinity for the young Arturo. Plot-wise, I found myself anticipating Arturo’s full embroilment in the seedy mafioso underbelly, in however an unfortunate or incidental a circumstance (a la Burn After Reading or A Film With Me In It) but was left disappointed. The movie does (albeit briefly) revisit the successful tone of its opening but instead of fostering affection towards the movie, imparted a disappointing sadness of what this movie could have been.